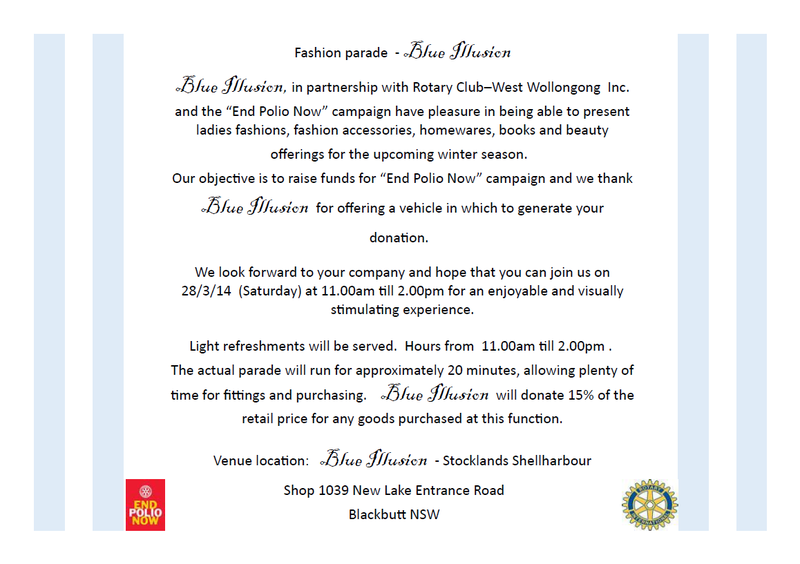 Blue Illusion, in partnership with Rotary Club–West Wollongong Inc. and the “End Polio Now” campaign have pleasure in being able to present ladies fashions, fashion accessories, homewares, books and beauty offerings for the upcoming winter season. Our objective is to raise funds for “End Polio Now” campaign and we thank Blue Illusion for offering a vehicle in which to generate your donation. We look forward to your company and hope that you can join us on 28/3/14 (Saturday) at 11.00am till 2.00pm for an enjoyable and visually stimulating experience. Light refreshments will be served. Hours from 11.00am till 2.00pm . The actual parade will run for approximately 20 minutes, allowing plenty of time for fittings and purchasing. Blue Illusion will donate 15% of the retail price for any goods purchased at this function.